Not to be confused with Penguin Pushers. Pushy Penguins is a 4-player minigame in Mario Party 5, and returns in Mario Party: The Top 100. 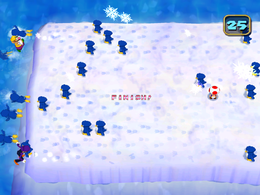 A group of igloos appears on the screen. A penguin leaves one of the igloos and walks to the far left in front of the players as they watch it dive into the water. The game then begins. 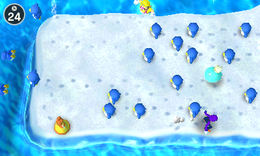 As players stand on a large chunk of ice, penguins run across from the right side of the screen and dive into the water on the left. Players must avoid the mob of penguins and find gaps in the crowd to avoid being shoved into the water. If the penguins succeed in pushing a player into the water, that player is out for the remainder of the game. Eventually, larger penguins would come as well. The last player standing, or any left standing after 30 seconds, wins. The player can also fall into the water on the top and bottom of the screen. If the timer hasn't run out and there is one character standing, all the penguins will stop at once and flap their wings while the solo character strikes their victory pose. If the timer has run out, the remaining characters strike their victory poses as usual. Rules – "Avoid the pushy penguins as they march to the sea. The last player standing wins." Advice – "The penguins will speed up right before they march into the sea. Don't get trapped!" Description – "Dodge the penguins without falling into the water. Last one standing wins!" On-screen – "Don't let the Penguin push you into the sea!" Portuguese Perigo! Pingüins! Danger! Penguins! It was originally called Penguin's Parade before the name was changed in the final version (this is a translation of the game's Japanese name). Pushy Penguins was also one of the playable minigames in the Mario Party 5 demo on the Mario Kart: Double Dash!! bonus disk. This page was last edited on September 22, 2018, at 11:18.